I decided I'd make a clean break and start a new thread here to announce (or re-announce - Youtube and certain other parties have made this far from easy) that my gaming channel venture has finally gone live as of... uhh... five minutes ago, I guess. I've done a straight re-branding of my old channel, so if you were previously subscribed to HdE Does Anime, you'll find yourselves automatically subbed. I'm leaving the old anime content viewable on the channel, as people seem to enjoy it an it's still bringing a little trickle of traffic my way. I've been asked if I'll still be doing anime stuff, so to clear that up, the answer is 'not for now, but never say never.' 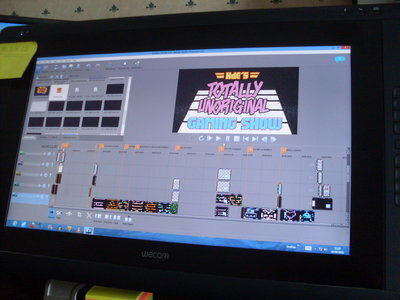 Everything is in 'let's see how this pans out' mode until my first season fo new content is fully uploaded. Yep! I'll be aiming to upload in blocks of 12 videos, with a break between each season to recuperate and re-evaluate where things are going. This is unfortunately a necessity in the ever changing Youtube climate. But for now... here's episode one! Just a quick update, guys and gals. It's early days in this venture, I know - but performance for this video has been ABYSMAL. 12 views. And now Youtube has killed it stone dead in search thanks to its crappy algorithms. I'd ordinarily write off poor performance as a case of folks simply not finding the content on offer appealing. But when weighing my subscriber count (currently holding at 238) against 12 views, something is going wrong. If you're subbed to the channel and want to see new content, please check that you've enabled notifications. Youtube is getting notoriously bad for not showing videos to subscribers. Alas I can not see that! I see a handful of names there in the special thanks part then the where we can follow you and finally about 10 seconds of blank darkness. I assume that it’s meant to be in those final 10 seconds? My bad! Checking things over, I see that your thank-you credit is actually appended on another video. Sorry about that! Just to be transparent here, I added a brief 'thank you' at the end of my first couple of videos to mention folks who had given feedback and comments that helped me to zero in on the best audio settings. There's a re-jigged version of my review of Asteroids for the Atari 7800 that I believe has your name in the credits. Should go up in a couple of weeks. I shall eagerly await that. Not that I don’t appreciate thanks or anything but you know you don’t have to, right? Ultimately I don’t feel I’ve done much, well anything really that’s actually been of benefit to you. That’s probably come out wrong, I’m not good at taking anything positive or explaining myself adequately. Tackling issues with audio levels proved to be a MASSIVE task prior to launch (I'm now left with something like 35 project where I need to either re-record audio or remix it) and your comments a ways back were actually very helpful. I had to collate a lot of different input from different people viewing things on different devices. Every little bit of information helped, in the end. Plus, you give my videos time of day. Which I'm always grateful for. A brief mention is the least I can do. New video up! This one's for Nintendo Switch owners with tastes that skew towards indie games. It''s a review of SUBSURFACE CIRCULAR by Mike Bithell. Advance tease of a video in progress. Like, LITERALLY a work in progress. The video I worked on yesterday is now live. It's a thorough dissection of the Sega Game Gear version of BUBBLE BOBBLE. This week's review is up! Warning: contains Hugh Jackman. And shirtless Hugh Jackman. Well, digitally recreated shirtless Hugh Jackman. Whatever - brace yourselves, ladies! Got to say you nailed that review. Ha! Cheers! This was actually quite a tricky one to put together. If it counts for much, I enjoyed it and agree with what you said. I’ve got to ask what you found tricky about putting it together so... what did you find tricky about it? If it counts for much, I enjoyed it and agree with what you said. That does indeed count for a lot! Views on these videos are pathetic at the moment. Of the ones I've made public so far, only one of them has hit as many as 30 views, and I've already had a couple of attempts at open trolling / dislike bombing. So to hear that folks are enjoying them at least comes as a nice boost. Theres truthfully such an over-saturation of this kind of content on Youtube that getting any kind of feedback at all is very difficult. So thanks! I’ve got to ask what you found tricky about putting it together so... what did you find tricky about it? This one was tricky for several reasons - and I actually bumped it up the review schedule a bit just because I was sick of looking at it. First up, it was one of several commentaries that I had to record multiple times over. The first take corrupted. The second was done on a Lavalier / digital recorder set-up that later proved inferior to using my trusty old Yeti mic. Then the third take required excessive cleaning, and parts of it had to be entirely re-recorded. Even though I've got a fair bit of experience working with audio, it was quite a challenge to piece a seamless track together. THEN I ran into a very odd problem with my capture device. Despite being correcty set up, big chunks of the footage I recorded simply didn't want to play ball when I converted them for use in my editor. Very strange. Especially as this has never happened with anything else I've tried to capture with it. Some of the footage I SHOULD have had for the review painted a much more exciting picture of the game, I think. Getting that gag with the cup of coffee to film properly was a nightmare as well. It's been on my mind that I want to include little comedy moments like that in the videos to offset the dryness of the reviews. But of course, I had to buy the world's WORST camcorder for the job. Fun fact: I ended up borrowing an LED light and tripod from a photographer friend of mine for that. A lot of fuss for a throwaway moment. Basically, WAY more trouble than the video's current reach really warrants! I ended up doing a lot of very fiddly 'under the hood' work on this one. Sorry to hear about the trolling and dislike bombing, seems like a bit of a pathetic thing to do in all honesty. If you do specifically want feedback I can try to start giving it. Hope the other things you have planned turn out to be less of a pain to sort out. By this stage, it seems like it's just a built in part of the Youtube experience. It is indeed pathetic, but if the site provides the mechanism for it, people will dependably jump on it. I've killed visible ratings on videos now, and that seems to have deterred the day one insta-bombers. You can still click the like button though - and it'll still help! At this stage, I'm not really looking for feedback on videos by way of critique. There's a lot of content that's been knocked into shape and scrutinised backwards and forwards, and I'm pretty happy with where things are. If anybody experiences any technical issues, though, that's good to hear about. I recently increased the mix level of my audio after receiving reports that it was coming through very quiet for some folks. So info like that is helpful. Right now, what I need more than anything is to get eyes on the actual videos! If there's anything in them that folks really take exception to, I expect I'll hear about it. Okie dokes! The latest video is up now - and it's a re-jigged and re-mixed version of my review of ASTEROIDS for the Atari 7800, with improved audio and a marginal tweak to the video settings. I'm working like mad to get next week's video ready, which is going to be a bit of a Monster. After that, I'll be taking a two week mid-season break to sort out some details for the channel and look into ways of funding further content production and increasing its reach. Oof. I done a big one. This week's review, which took more effort than it should have considering 75% of it was finished last year, viewable now. Giving you guys a little bit of early access, as it won't be visible on Youtube properly until 6:00pm. I've not reviewed anything for the Xbox 360 on my channel as yet, so what better way to start than with HALO: REACH.